Vacansoleil announced the hiring of former U23 European champion Kris Boeckmans. Sprinter Boeckmanns will play a role in trying for victories in the bunch sprints. 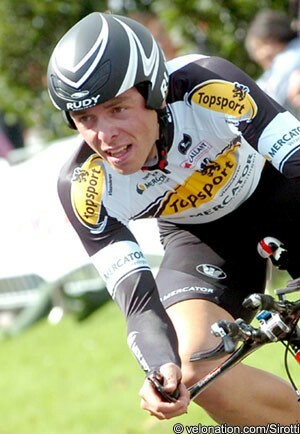 The Belgian was a stagiaire with Lotto in 2009 but turned pro in 2010 with Topsport Vlaanderen. He won stages in the Driedaagse van West-Vlaanderen and the Ster Elektrotoer in his first pro season. This year did not start too well, he had to sit out with knee problems for two months. His racing since then has seen him getting 12th in the Belgian Nationals and sixth in the GP Bochum, but also not finishing races like the Tour of Denmark and the Eneco Tour. "I want to finish this season well, by showing myself in the one-day races," Boeckmann says. "I know that this team has experience to give young riders a chance to ride at the highest level. I really want to prepare the next season well." Team director Jean-Paul van Poppel sees a fast man approaching. "Boeckmans fits into our racing strategy. I was impressed by his speed."